Cute and functional! These socks are perfect for large & giant breed dogs to wear indoors on cold slippery floors. These non skid dog socks are perfect to prevent sliding on slick floors, paw protection for wounds, protecting brand new hardwood floors or furniture from scratches. Also can prevent excessive paw licking or scratching due to allergies. 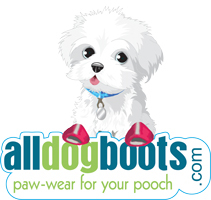 Ideal for dogs who are in-between shoe sizes to provide a better fit. My poor golden lab loves our new house with one giant exception. He hates trying to walk on the beautiful hardwood floors. He is no little lap buddy, and even sitting at my chair, one of his favorite hangouts, proved problematic as his forefeet slipped right out from under him and he ended up laying on the floor. When the dog socks arrived from alldogboots.com he wasn't sure if he was going to like them. I carefully followed the recommended introduction of his new socks moving forward a baby step at a time. within a few days "Buddy" was wearing the socks and barely seemed to notice. It's been a real blessing to the human members of the family as well, since we don't have to listen to the tap tap tapping of his toenails on the floors. Thank you for a simple and very effective solution to a not-so-simple problem. Ordered a pair for my 7 1/2 year old Great Dane because of his arthritis he has a hard time on hardwood & tile flooring. They are super cute and seem to work pretty good. Wish they had a strap or something at the top to help keep them on but they work good for around the house. These fit my Golden Retriever perfectly and she seems quite comfortable in them. She has injured one of the pads on her front paw and this will certainly speed up the healing process. Nice that they are non skid!